Precast Concrete Product - A concrete product manufactured in a controlled plant environment, which ensures higher standards of quality control and more uniform appearance and strength. Precast concrete products include three-sided box culverts, four-sided box culverts, manholes, box structures, curb inlets and catch basins, foundation pads, grease interceptors, septic tanks, retaining wall blocks, underground utility vaults, pump stations, pipe, stormwater management, among others. Watch the What It Takes videos for examples of precast concrete manufacturing processes. NPCA - The National Precast Concrete Association (NPCA) is an association representing precast concrete manufacturers and suppliers of products and services for the precast industry since 1965. The NPCA offers an ANSI-accredited plant certification program, which holds certified precast concrete manufacturing plants to high standards of quality throughout the manufacturing process. ANSI - Founded in 1918, the American National Standards Institute (ANSI) is the voice of the U.S. standards and conformity assessment system. ANSI oversees thousands of standards and guidelines that impact all sectors of business to enhance the competitiveness of U.S. business and quality of U.S. life. ANSI also assesses the competence of organizations and their conformance to standards as part of their accreditation. ASTM - One of the largest voluntary standards developing organizations in the world, the American Society for Testing and Materials (ASTM), now known as ASTM International, uses a wide international base of voluntary members who sit on committees that develop standards for materials, products, systems and services. Standards are developed based on consensus of the committee, which is made up of a varied group of stakeholders with an interest in the standards’ development and use. Drop Manhole - A drop manhole is a situation where the inlet comes into a manhole a distance above the outlet invert greater than the specified distance required by a utility. There can be both outside and inside drops. An outside drop has the pipe drop outside the manhole structure surrounded by either precast concrete or cast in place concrete. An outside drop can be set up either in the precast concrete plant or in the field. An internal drop has the pipe installed inside the manhole, and inside drops are field-installed. 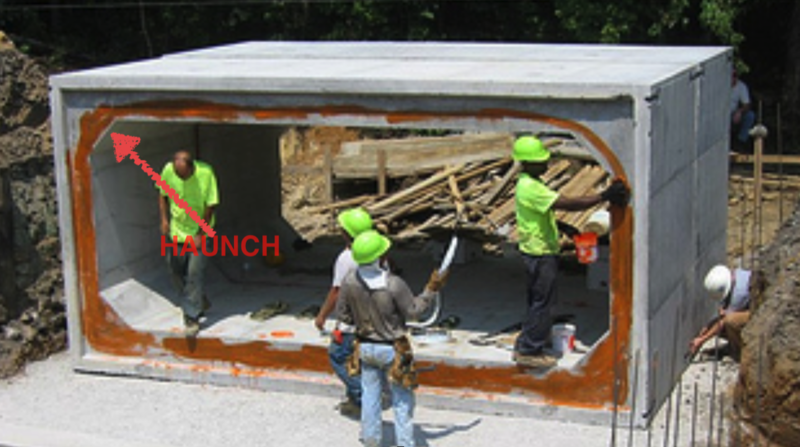 Haunch - According to Ronald E. Thornton, P.E., a box culvert haunch is a 45 degree fillet monolithically cast into the box section corners, the purpose of which is to add some degree of stiffness to the rigid frame section. The haunch further adds to the hook development of the corner reinforcing. See photo for example. Invert - An invert in a manhole is the elevation at which the interior of the incoming and outgoing pipe sits. It is commonly understood as a channel that runs through the base of the manhole from incoming pipe to out flow pipe. This channel is typically formed by using a half pipe to form the channel through the base of the manhole. The “half pipe” forming operation creates an unobstructed flow through the manhole. For more information on manhole inverts, see the NPCA tech note here. Grade rings - Precast concrete rings, sometimes referred to as spacer rings or donuts, are used to adjust the grade of the cast iron cover for manholes and catch basins. Grade rings provide a structure adjustment to ensure a casting is set at the proper finished grade. Minimum depth - The minimum depth is the shortest possible structure that will work in an application. The minimum depth is measured from the top of casting to the pipe invert. Pipe invert - The pipe invert is the elevation of the bottom of the inside of the pipe. Pipe invert can also be known as the flow line. Cast-in - When an accessory is placed in the precast concrete product and the concrete is poured into the forms around it. The complete assembly of a cast-in accessory cannot be easily removed as it is poured into the concrete. Cast iron frame and grates, aluminum hatches, covers, pipe sleeves and more can be accessories that are cast-in. Casting - A casting is a cast iron cover with lid or grate used to cover the top of a manhole or catch basin. Green - Green concrete is concrete that has set but has not reached its specified minimum compressive strength. Lifting Eyes - An attachment connected to a lifting pin anchor, which is poured into precast concrete products, that aides in the lifting and transport of precast concrete products. Lifting eyes can be connected to hooks and chains from a lift or crane. The lifting eye has rotation capability to allow the precast product to be lifted, tilted, or rotated while under load. Lifting pin placement is important to have a stable and balanced load during lifts. Base - A manhole base is the bottom section of a manhole. An invert or flow channel may be poured into a manhole base if required. Riser - A manhole riser is the section or sections above the base on a manhole to raise elevation to meet the top cone section. Flat top - The top of a structure that is flat and not conical.